Some changes come to our W0ZSW remote base station. 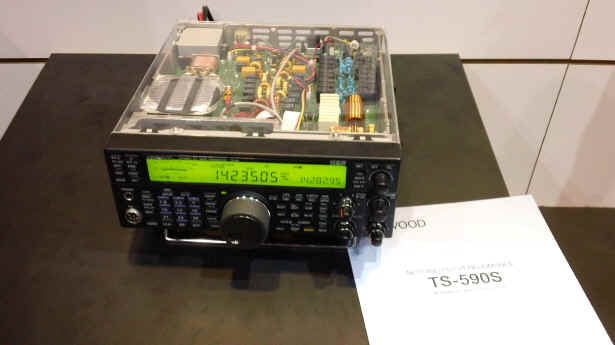 A Kenwood TS-590S, as seen at Dayton. The cutaway top reveals the inside of the radio in this display model. We have been hinting for some time now about putting the Kenwood TS-590S in place at W0ZSW. Here you see a cutaway version at the Kenwood booth at last year’s Hamvention®. There are several good reasons to begin our test run now. One is that the TS-480HX finals have failed and the temporary replacement IC-7200 does not provide voice frequency readout for our blind members when operated as a remote. Another is that the excellent Kenwood ARCP-590 software provides very good access to all radio functions, which includes the option to turn the voice frequency announcements off or keep some of them but make the radio less verbose. This has been one of the most requested options from sighted users, who find the speech announcements distracting. But there is a down side to the change, too. While the W4MQ software we have been using allows us to limit transmit privileges by license class, there is no such provision in the Kenwood software. The W4MQ software is also quite limited in its functions to basic controls only. The Kenwood software really opens up the radio for all sorts of customization by the users. We already have some supporting material on our remote base website for the W4MQ software, but nothing for the Kenwood software. With those things in mind, we are limiting the initial user base to carefully chosen operators who will be able to learn and use the software without a lot of hand-holding. These will include some blind users and some sighted, but what is common to all of them is that they will have operated remotes in the past and they know what they are doing and can problem-solve. They know how to stay within the band and follow the rules. This isn’t exactly handy for the rest of the existing W0ZSW user base, but remember that W0EQO is available as an alternative and does feature a Kenwood TS-480SAT with speech frequency readout. W0ZSW currently uses a 270 foot double extended zepp antenna, commonly referred to as a “W0OXB Special”, and it’s a great wire antenna that can be tuned 160 through 6 meters. We expect to use that antenna for the TS-590S, which means shutting down the existing W0ZSW station – because it won’t have an antenna! Tech support is a fact of life with this stuff, but we will try to head most of it off by posting updates on the Handiham Remote Base website. Time is in short supply, and this is a big project. We appreciate it when users check the website instead of picking up the phone and calling us to let us know that W0ZSW is off line. The website is also the quickest way to find out what’s going on, since leaving a voice mail between Thursday afternoon and Sunday will result in days of waiting for a response. When the TS-590S goes live, we will begin learning the ways of the new system. No doubt we will be delighted with some features and puzzled by others. We will run into problems, of course. There are always unexpected issues with every new system. What we would like to do is to iron most of them out before adding more users from the old W0ZSW user base.